The paintings Dark Side of the Moon, Side 1 (Speak to Me) and Dark Side of the Moon, Side 2 (Eclipse), (both made in 2013) are part of a series by Tomas Vu titled Flatlands. Tomas Vu, “Dark Side of the Moon, Side 2 (Eclipse),” 2013. Oil on panel with collage. Courtesy of the artist. Photo by Zack Garlitos. Large and highly detailed, they feature a mixture of abstract and representational forms variously rendered through the use of acrylic paint, silkscreens, and laser-cut wood. The combined effect of all these processes coexisting on the same picture plane is distinctly psychedelic, resembling a cross section of the Big Bang isolated in a petri dish and viewed through a microscope. Masses of intertwining geometric shapes create islands in the void, across which miniature Bridget Riley paintings float like bubbles. Multiple images of helicopters and sports stadiums also exist in this mostly abstract environment, swimming through the interstitial spaces like protozoan organisms. If you increase the amplification you can see tiny astronauts hiding in the foliage, taking cover while a Huey flies overhead. However, which way is up and which way is down is a question open to debate, as the illusion of three-dimensional perspective appears to have come unmoored and everything is now happening at the same place and time. The series takes its title from Edwin Abbot Abbot’s 1884 book Flatland: A Romance of Many Dimensions, in which the narrator describes life in the second dimension, a.k.a Flatland. This narrator also goes on adventures to the first and third dimensions only to meet with persecution upon returning to his native Flatland, where his tales of other dimensions are condemned as the dangerous rantings of a heretic. Written as a humorous and fantastical novella, the book not only explores mathematical and scientific concepts but also functions as a satirical critique of Victorian society, poking fun at its entrenched notions about class, race, and gender. Women are relegated to a second-class status in Flatland, consisting only of single line segments, while males consist of geometric forms with multiples sides, their class status being defined by the number and regularity of those sides (for instance, the narrator is a humble square, which puts him fairly low on the totem pole beneath the many sided polygons of the ruling class). While the leadership of Flatland is secretly aware of the existence of other dimensions, they hide this knowledge from the public because it carries with it the implication that things could be different. In their own way, Tomas Vu’s Flatlands also present a cheeky critique of the status quo: the figurative elements of the helicopters and other symbols of the technological sublime are superimposed into an abstract landscapes alongside the op-art designs of Bridget Riley, showing how multiple histories can co-exist at the same time. In this context, the technological feats of men seem like cheap little toys in comparison to the towering yet intangible feats of a single woman artist, each of these symbols representing a totally different mode of thought. 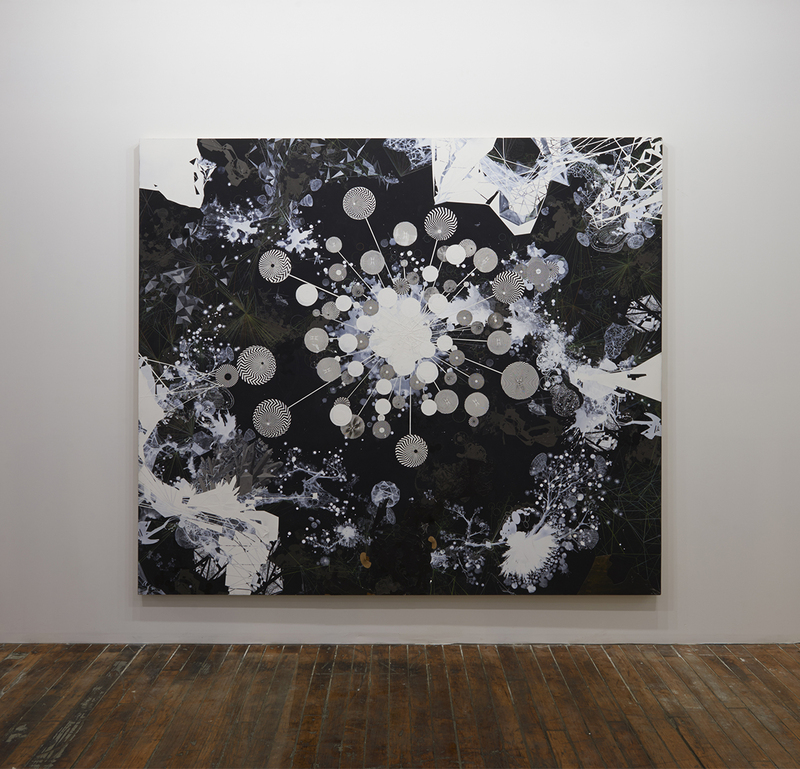 Riley began making those trippy black and white paintings in the early ’60s, at the same time as the United States was ramping up its involvement in the Vietnam War—a war they were confident that they could win through the use of superior air power, resulting in one of the most brutal bombing campaigns in the history of mankind. Such are the contradictions of the world we live in, where the psychedelic revolution and the “Summer of Love” and a travesty such as the Vietnam War could take place at the same time on the same planet. Meanwhile, the proliferation of new information technologies mediates all these narratives, flattening them first onto TV screens, and now computers, phones, and tablets. Whether this new revolution in information technology is headed for utopia or dystopia is yet to be seen; most likely, the two will coexist side by side, as they do in Vu’s Flatlands.